Shrewsbury Charity Fun Day, left to right, police officer Marv Choudhury, Mayor and Mayoress of Shrewsbury Peter and Julie Nutting with firefighter Andy Davies. Front are Anna Rouse and daughter Beau Kelly (age 5). Organised by firefighters and police officers, the event at Shrewsbury College in London Road was opened by the Mayor and Mayoress of Shrewsbury. A steady stream of visitors attended throughout the day including ten children from Chernobyl who are in Shropshire for a holiday. They had been due to go to the seaside but instead attended the fun day due to heavy rainfalls forecast for Wales. “We had a steady stream of people as the weather improved and the event was a great success,” said organiser Andy Davies, of Shrewsbury Fire Station’s Blue Watch. Emergency rescue vehicles and military vehicles were on view for visitors to inspect with entertainment for all the family including target shooting with Laser Clays. Members of the Rifles regiment were also there. Three of Shrewsbury Town’s footballers also called in to support the charity day which included a seven a side football knockout tournament. 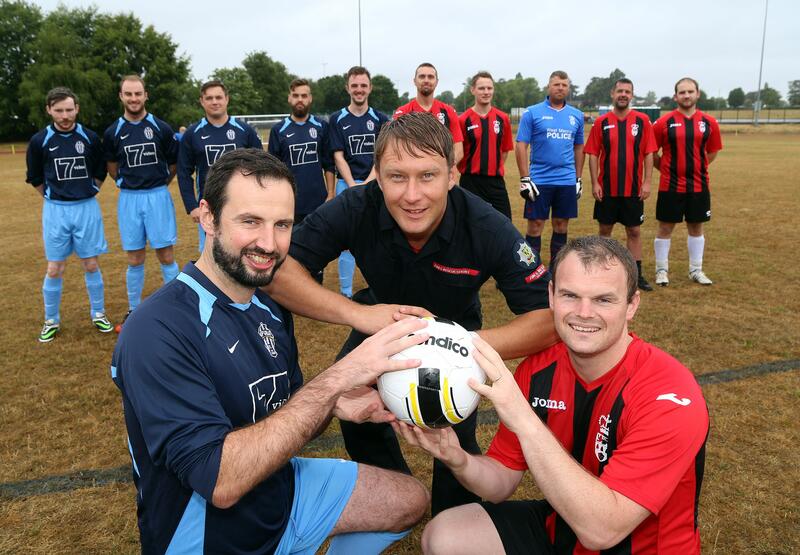 Teams from fire, police, Army, RAF and the local council competed for the Shropshire Services Shield which was won by the RAF which knocked out a team of footballers from Shropshire Fire and Rescue Service in the final. All funds raised during Sunday’s (July 29) event were shared between Shrewsbury MIND and West Mercia Search and Rescue. For more information visit Shropshire Fire and Rescue Service on Facebook and twitter.